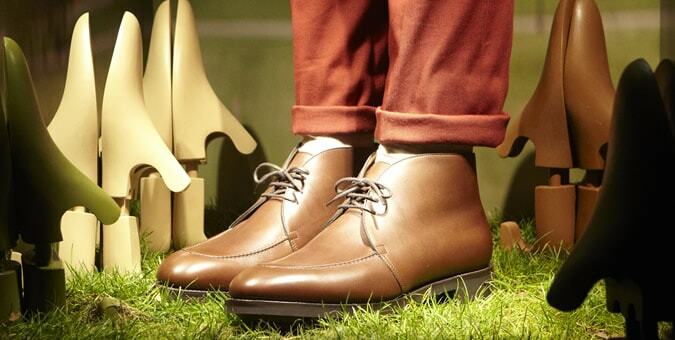 The great British shoe had a moment at this year’s London Collections: MEN. Heritage brand John Lobb opted to unveil its latest collection on the closing day of the menswear event. Housed in the basement of London’s Victoria House, the Northampton-based luxury bootmaker presented its AW14 range of classic and new styles, revealing the breadth of the brand history. 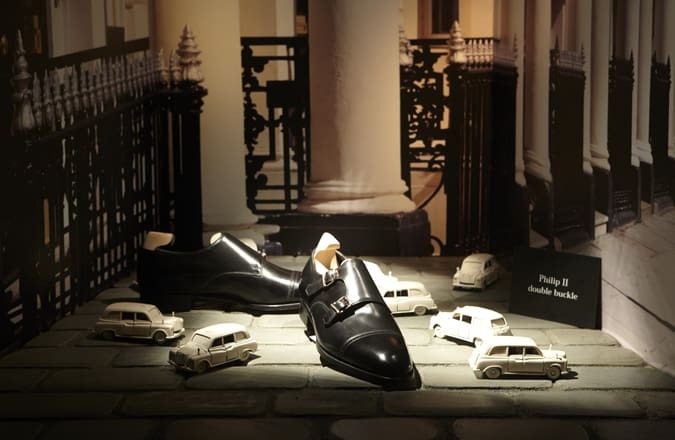 The stand-out silhouette on display, presented in a booth surrounded by miniature London Taxis, was John Lobb’s Phillip II double monk-strap shoe. Crafted using the brand’s deep technical knowledge and finished off with two rose gold buckles, the style is a development of the classic John Lobb single monk-strap. An ankle boot, dubbed the Jodphur II, also made an impact. The single-strap shoe was delivered in new colour ways of plum and deep bottle green. Named after South West England’s historic Dorset market town, The Wareham style was Lobb’s winter boot offering. With a hand-sewn apron front, three blind eyelets and a moisture-repelling rubber sole, the Wareham appeared in rich autumnal colours of redwood, bamboo, walnut and black calf leather. Director of Communications Benjamin Chatfield was in high spirits as the British bootmaker presented at LC:M for the first time: “The latest collection reflects the vibrancy of the brand and everything that is masculine about men’s footwear,” he said. The brand, which has produced the finest men’s shoes and boots since 1849, took its first steps into men’s accessories late last year. John Lobb’s ‘Personal Style’ line now offers ties and belts, using the same craftsmanship approach as the footwear. Chatfield went on to comment on the company’s desire to provide “a new trend towards dressing with personal style at the heart”. With stores around the world now showcasing the brand’s latest footwear and accessories, John Lobb is accessible in most major cities as well as online at JohnLobb.com and from stockists including MR PORTER and Harrods.